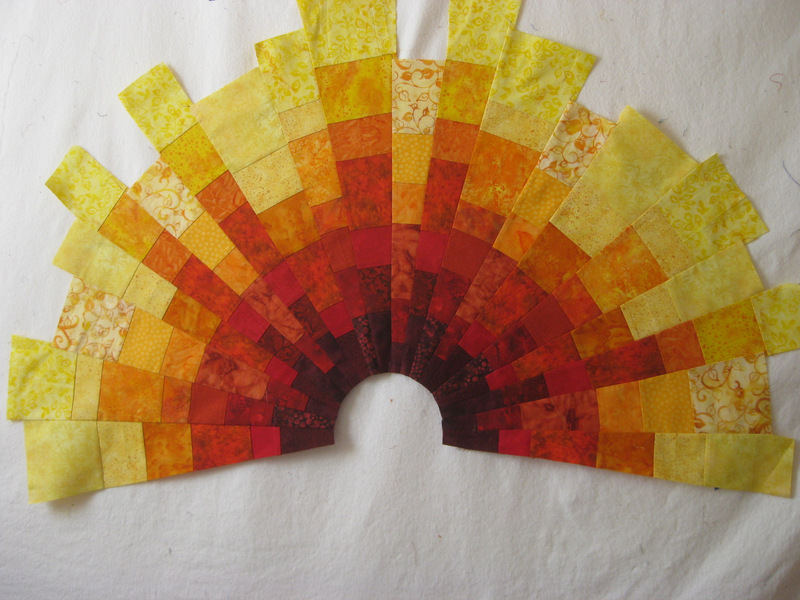 This week I made a fairly simple contemporary design of a sun with a wide variety of yellow, orange, rust, red and maroon fabrics. 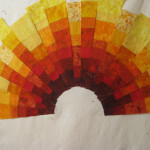 I like to use many different fabrics even for the same color groups because I like the effect of the variety of fabrics. This is a design in which you first cut strips of fabric in varying widths then sew together at least four different sets of the color gradation. 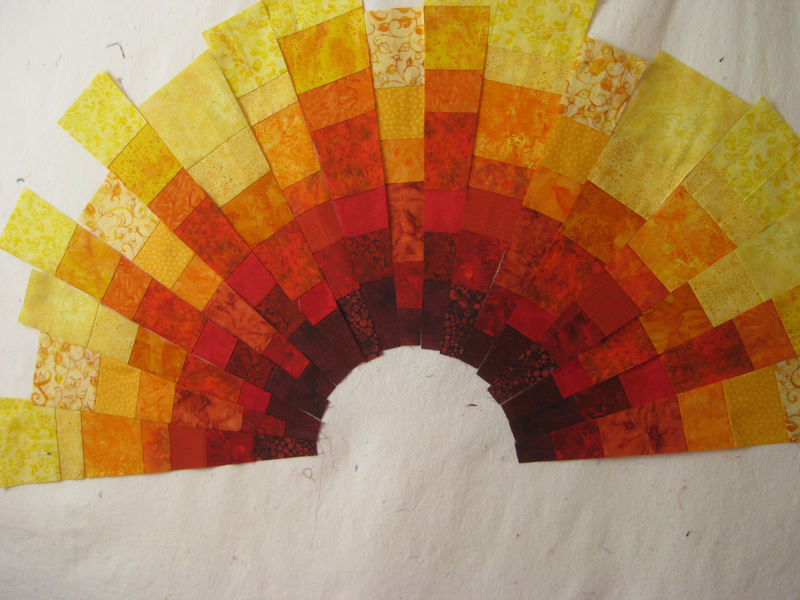 I made two design templates from which to cut my “rays” from the 4 different compositions of my colors. 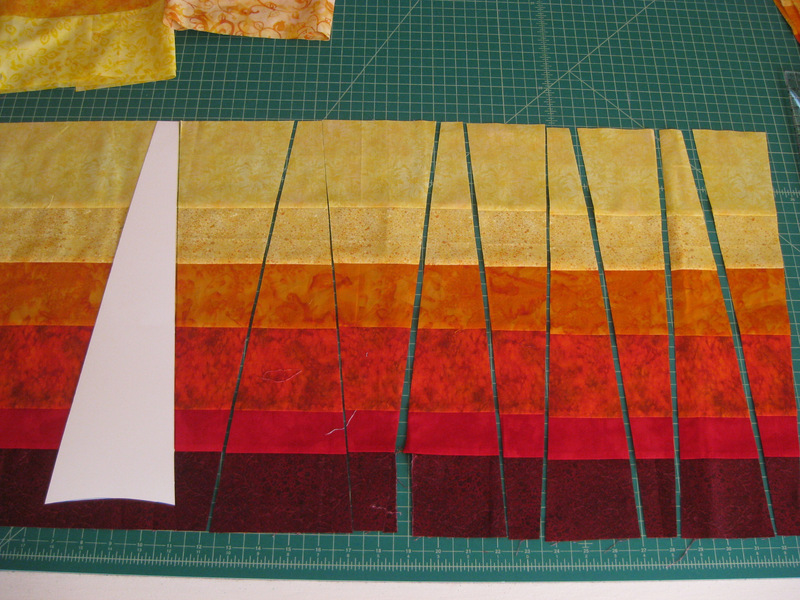 For this quilt I wanted the dark red colors in the center but when you cut ray-like templates there is some waste so I carefully reversed every cut so I now have a set of rays to make another quilt with the yellow pieces in the center….no waste!! Then the fun part of organizing the “rays” on my design wall in a half arching sun. The opening for the center half circle is much larger than the finished quilt because the seam allowances of the 20 rays will compress the arch of rays. 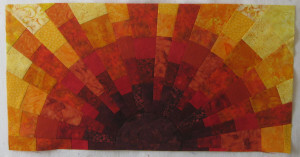 After sewing these together in the arch design I add the maroon “sun” which is a circle pieced in, not appliqued. 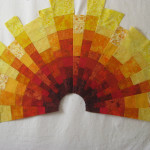 I use a full circle which is then cut down to a half circle when I square off the quilt. Experience has taught me that the size of my circle piece must be 1″ larger diameter than the circle opening in my quilt. If this is carefully sewn in, the circle will press down nice and smooth! 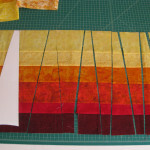 The more varied you make the strips for your four combinations of the colors, the more wonky the quilt will be. I have attached pictures of my process. The final quilt was 13″ x 26″.